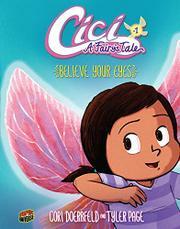 Alongside changing friendships and her parents’ imminent separation, Cici learns that she is also a hada, or fairy. Cici's 10th birthday isn't going quite how she imagined it. She won’t be celebrating with her family and her best friend, Mia, like always: her dad’s moved out, popular Hazel is throwing a hot-tub party on the same day, and she’s unexpectedly sprouted a pair of shimmering pink wings. Cici's visiting abuela tells her that she is, like many of the women in her family, a hada. She has newfound powers besides the wings: she also has the "fairy sight," which lets her see people and situations around her as they truly are (like seeing mean-girl Hazel and her followers as a flock of chickens). Cici learns she has only one day to decide whether she wants to remain a hada or to surrender her powers forever—but with all the confusion about her parents and friends swirling about her, what should she choose? This first volume in a series offers surprisingly more depth than the pastel-pink fairy images might indicate. Conjured with a pleasing, candy-colored palette and surrounded by evocatively expressive secondary characters, Latina Cici is wholly likable, and her real-life concerns play out well juxtaposed with her more whimsical ones.